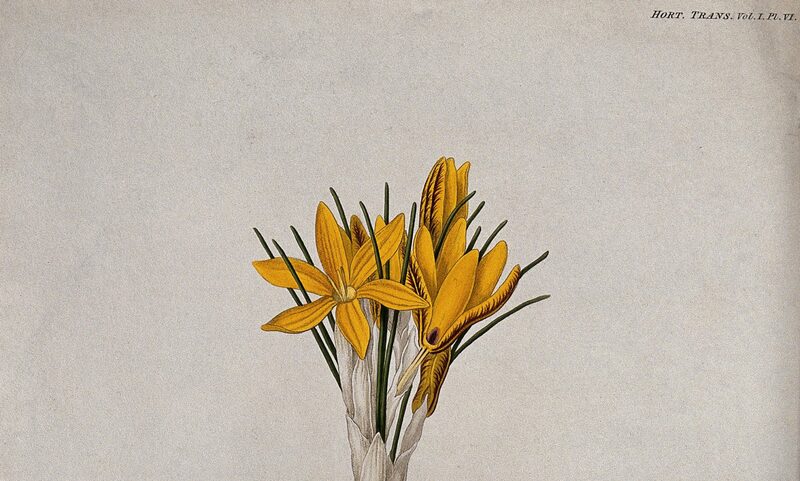 The Recipes Project heads to San Marino, California this month, to learn about the recipe collections of The Huntington Library, Art Collections, and Botanical Gardens. We spoke with Alan Jutzi, Curator of Rare Books, and Shelley Kresan, rare book cataloguer for the Huntington’s new Anne Cranston American Regional and Charitable Cookbook Collection, about the many recipe sources – both early modern and modern – held at the Huntington. The Huntington Library, San Marino CA. Image courtesy of Wikimedia Commons. 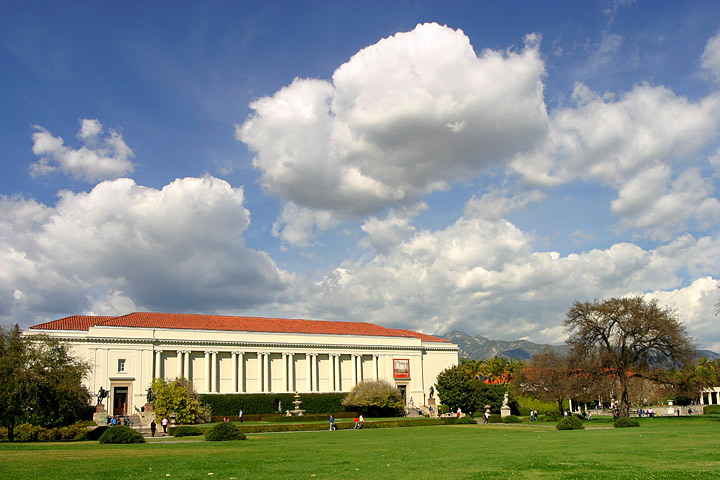 The Huntington is known for the breadth of its collections, which have particular strengths in British and American history as well as the history of the American West. Tell us a bit about the early modern and modern recipes materials held at your institution. During Henry E. Huntington’s buying splurge between 1910 and 1927, he acquired large English and American libraries and archives that included printed herbals, cookbooks, and works on domestic management as well as manuscripts dealing with medical and food recipes. Examples of some of our major English holdings include the Bridgewater House Library (16th-19th centuries), which incorporate the Ellesmere papers, and the Stowe House manuscripts (mostly 16th-18th centuries) which entail the Temple, Brydges, and Grenville family papers. The Robert A. Brock Collection (17th-19th centuries) on Virginia is an example of a large American collection of published works and family and regional archives. Identifying early modern and modern printed recipes is much easier than locating those in large archival manuscript collections. The Huntington’s holdings in pre-1801 imprints from the British Isles and North America appear in the English Short Title Catalogue (ESTC). All of the catalogued cookery publications appear in the Huntington’s online catalogue. The library has continued to concentrate on English and American cooking and culture by adding new materials, primarily through gifts to the library. In 1983 we acquired the 500-volume California cookbook collection of Helen Evans Brown and Philip S. Brown. A related collection that the Library has recently received is the Jay T. Last Collection of Lithographic and Social History. It includes a huge section of ephemeral printing dealing with American food and beverage promotion. For information and access to manuscript materials and the Last Collection, researchers should contact the curator – they can find out how to do this via the library staff directory on the Huntington website. I was especially excited to learn about the Huntington’s Cranston Collection, which includes 4,400 British and American cookbooks from the 19th and 20th centuries. What’s the history behind the Cranston Collection, and how did it come to be a part of the Huntington Library? 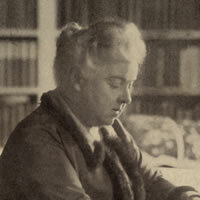 The Anne M. Cranston Collection on American Cookery was donated in 2000 by her daughter Elanne Callahan, of San Marino CA. It includes several thousand “trade” cookbooks, printed by major publishers over the last 150 years, and an equal number of “charitable” cookbooks from the same period. The Cranston Collection consists of four main categories of cookbooks: 1) those written by the forerunners of the home economic movement and the heads of culinary schools in the late 19th century to promote the education of women; 2) 20th-century cookbooks that took cooking to a higher precision, which includes many foreign recipe books published in English; 3) 20th-century ephemeral cookbooks and pamphlets (e.g. 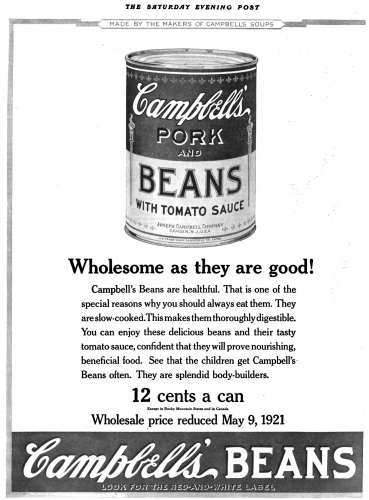 Campbell’s Soup and Corn Products Refining Company promotional cookbooks,) 4) charity and fund-raising cookbooks created by churches, schools, hospitals, clubs, philanthropic organizations, etc. 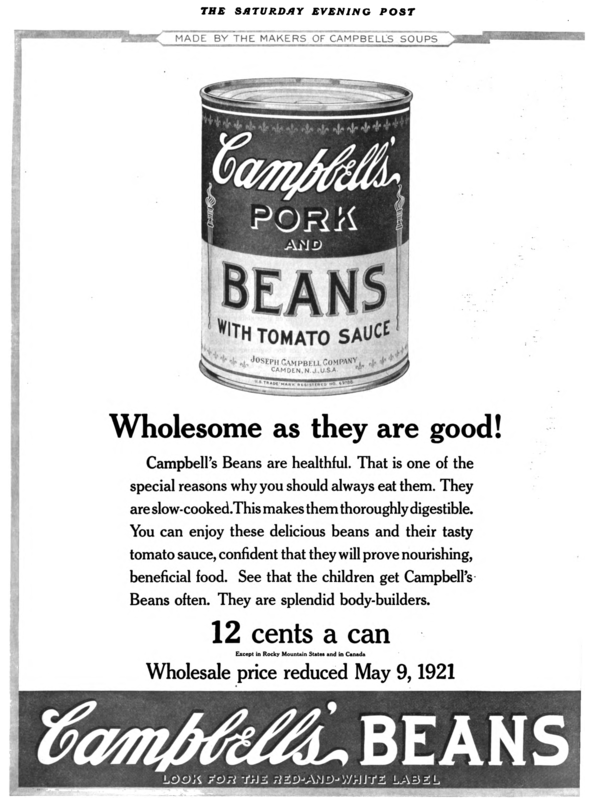 Joseph Campbell Company canned beans advertisement in the Saturday Evening Post, 1921. Image courtesy of Wikimedia Commons. The Huntington’s primary reason for accepting the Cranston Collection was the depth of the regional and charitable sections; indeed all of the research done in this collection since its arrival has been in those areas. And even in Mrs. Cranston’s home, the collection was organized by region, state, and city. Anne M. Cranston (1906-1993) was a fascinating figure; she came to Southern California with her husband William E. Cranston in the early 1930s, and he founded the Thermador Company (which specialized in electrical, and especially kitchen, appliances) in Los Angeles. Mrs. Cranston began to collect cookbooks around this time, and it was a pastime she continued throughout her life. It is obvious that she loved the hunt for the books as much as recipes the books contained. She was a bibliophile. Shelley has been writing some great posts on the Cranston materials for Verso, the Huntington’s blog – and the public’s response to those posts has been terrific. People love to engage with culinary sources from the past! Does the Huntington have any future plans to make these materials widely accessible? The Huntington Digital Library, representing only a fraction of our holdings, is an online tool to aid in the dissemination of just some of the library’s rich and unique collections. It is designed to support the research needs of Huntington readers and staff, and to share digitized resources with the broader community. The Huntington would certainly like to do much more with its cookery holdings, but we see our first responsibility to make collections available that will be consulted by our researchers. Eventually we anticipate more blogs, exhibits, conferences, and closer interaction with historical culinary organizations. There is nothing specifically planned for the near future. Modern recipes were often used to circulate ideas about supposedly “exotic” or “foreign” nations and cultures. In the Cranston materials, do you see evidence of 19th and 20th century Americans experimenting with recipes from different cultures, geographic regions, religions, or ethnic groups? Agnes Jekyll. Image courtesy of Wikimedia Commons. But modern American cooks also saw European cuisines as “novel” and “sophisticated.” The large selection of books on European cuisines published in English, as well as souvenir cookbooks that were obtained by Americans traveling to Europe, indicates the willingness of both American chefs and home cooks alike to venture into exotic and foreign territory. Recipes frequently feature notations and marginalia made over the course of many years by the cooks who used them. Can you tell us a bit about the marginalia in the Huntington’s recipe collections (both early modern and modern)? The Huntington rare book cataloguing descriptions attempt to provide copy-specific information with notes about manuscript notations and inserts; however, not all early modern or modern books have gotten this full treatment. There is no easy access to annotated recipes in early modern printed books. The most marginalia to be found is in the American charitable cookbooks. These are corrections to the printed text, recipes mostly on the flyleaves, and recipes transcribed on separate sheets. These marginal, handwritten recipes, as one can imagine, are mostly those of the owner or ones received from a relative or friend. From working through the volumes, it appears that the majority are for breads, cakes, puddings, and desserts, but there are plenty of main dishes, appetizers, and side dishes. Some examples of marginal recipes in the Cranston Collection include scrawled recipes for a Lady Baltimore cake, a date pudding, and even a vegetarian meat substitute loaf made from lima beans. There is much yet to be found in the Huntington’s extensive cookery collections. The search will lead in many directions, and the culinary rewards will be plentiful and rich.